A solution of honey and water seems just the right tonic for a thirsty lady beetle on a winter's afternoon. With spring fast approaching and days growing longer, many insects in and around our homes awake from their wintry slumber to pay an unexpected visit to their human hosts. You may recall, in autumns past, Bug of the Week visited the multicolored Asian lady beetle, a squatter that invades homes in search of shelter. Over the last week or two I have heard stories of lady beetles emerging from retreats in attics or basements and flocking to windows and interior walls on the sunny side of people’s homes. In the wild, multicolored Asian lady beetles and their relatives are still chillin’ out in crevices between rocks or under the bark of a tree for several more weeks. Warmer temperatures in a home fool our misguided friends into sensing that spring has arrived. Why are they in my home in the winter? Unfortunately, Mother Nature has not yet set the table for the feast outdoors and most of us simply do not have enough aphids or mealybugs on our house plants to keep a batch of hungry ladybugs sated after months of hibernation. With such a dilemma what are bug lovers to do? If you find large numbers of ladybugs wandering about your home on warm days in late winter, and you favor preservation to annihilation, you can simply sweep or vacuum up the ladies and deposit them in a suitable location outdoors such as a tool shed or a pile of brush or firewood. Outdoors they will seek a nook in which to hide and become one with Mother Nature’s timetable. Once synchronized with ambient temperatures they will emerge just in time for the vernal feast. They don’t have long to wait. Red maples are in bloom and crab apple trees are not far behind. Soon a fresh banquet of aphids and other bugs will be served. Another interesting approach to assist our six-legged friends was presented by a fascinating woman I call the “Beetle Whisperer”. As lady beetles emerge from their redoubts and collect on windows and walls in her home, she prepares a sugary concoction of water and honey for her guests. This “beetlejuice” is placed in small droplets on house plants or served on a saucer. Beetles placed nearby eagerly gather around the nutritious liquid and drink their fill. Whiling the winter away indoors appears to be thirsty work for a beetle. This all sounds a bit far fetched, but entomologists use similar feeding techniques to keep small insects such as beneficial wasps and other predators alive in our laboratories. The Beetle Whisperer tells us that her boarders seem quite happy with this fare and can be maintained for several weeks on beetlejuice until spring has truly arrived and the ladies can be shooed outside to her garden. In this way she has the pleasure of watching the antics of her guests knowing full well that they will wage war on pests in the garden later in spring. How clever! 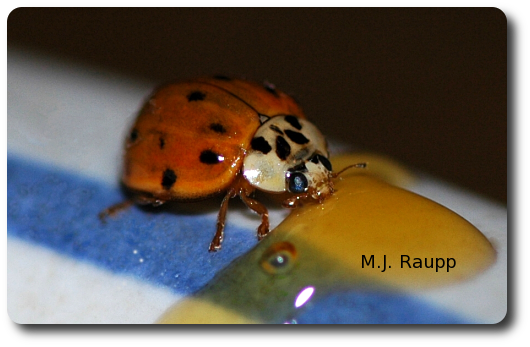 Because each lady beetle has a distinctive pattern of spots on its back, individuals can be recognized on sight and, yes, many of the Whisperer’s boarders have names. Asian multicolored lady beetles are reported to live for three years. Wouldn’t it be interesting to know if some of these ladies make a return visit each year for room and a saucer full of beetlejuice?